You're busy trying to lead a "full" life. But does it really feel full - or are you stretched too thin? Enter Stew Friedman, Wharton professor, adviser to leaders across the globe, and passionate advocate of replacing the misguided metaphor of "work/life balance" with something more realistic and sustainable. If you're seeking "balance", you'll never achieve it, argues Friedman. The idea that "work" competes with "life" ignores the more nuanced reality of our humanity - the interaction of four domains: work, home, community, and the private self. The goal is to create harmony among them instead of thinking only in terms of trade-offs. It can be done. Each of these admirable (though surely imperfect) people exemplifies a set of skills - for being real, being whole, and being innovative - that produce a sense of purpose, coherence, and optimism. Based on interviews and research, their stories paint a vivid picture of how six very different leaders use these skills to act with authenticity, integrity, and creativity - and they prove that significant public success is accomplished not at the expense of the rest of life but as the result of meaningful engagement in all its parts. 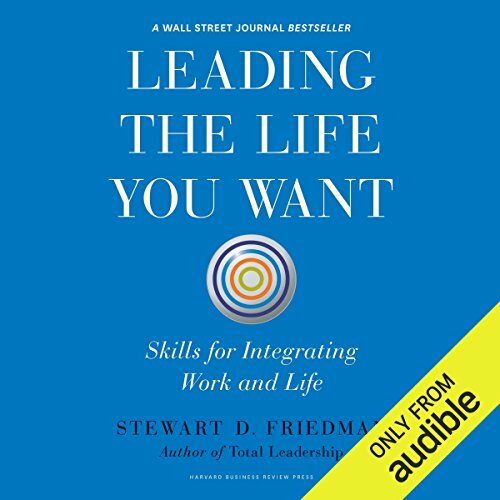 With dozens of practical exercises for strengthening these skills, curated from the latest research in organizational psychology and related fields, this book will inspire you, inform you, and instruct you on how to take realistic steps now toward leading the life you truly want. ©2014 Harvard Business School Publishing Corporation (P)2016 Audible, Inc.